If you haven't read this story about Brian Wansink, you really should give it a read. What a story. Basically, thanks to a mostly terrible (now deleted) blog post, a small raft of papers around food/behavioral science have been retracted or corrected. I really enjoyed this piece about long-haul moving truckers. Nice writeup by Neal Anderson of methods to remove ruthenium from metathesis reactions. I recently sent an e-mail to Dr. Willie E. May, who is currently running for the ACS President-Elect position to see if he was interested in answering last year's questions for ACS presidential candidates. Interview and resume review workshops for chemists at any stage of their careers as well as programs for aspiring entrepreneurs are among the many valuable ACS programs for job-seekers. ACS appears to have made considerable effort to address unemployment among chemists, which is important, especially if weak spots develop in the market ahead. ACS should put more energy into assisting the young people – who we are encouraging to pursue chemical science careers – to find gainful employment. I was informed just last week of a staff reorganization intended to strengthen ACS job and career programs for members. I would like to get additional details before commenting further; it is probably prudent to allow time to see the impact of these changes and I pledge to track these changes. ACS policies are based on a recognition that the contributions of chemical scientists and engineers are essential in solving many of the world's pressing challenges. So there always will be a need for the best and brightest who want to be part of global solutions to become chemists and other scientists at the interface of chemistry. Unemployment of ACS members is still below the national average and dropped to 2.6%. Unfortunately, the salaries of many professionals have been stagnant. As ACS President-Elect, I would work tirelessly to help chemists get the best possible training for the available jobs and I would seek additional opportunities to promote and sustain the livelihoods of chemical science and technology professionals. I consider this to be a primary area of responsibility for ACS and the ACS President-Elect. 3. In the past decade, what was the one action of any ACS President that has had the greatest influence - good or bad - on members' employment and careers? Other than working groups and reports, what tangible steps would you take to increase the number of chemistry jobs in the US, and is this something you think is really achievable? ACS has come a long way over the past decade in seeking to boost employment and careers of chemists, and the Society’s members, in particular. That’s because all our Presidents have endeavored to strengthen our organization and move programs and policies forward with respect to career enhancements for chemical scientists, engineers, technologists and administrative professionals. ACS also has an opportunity, that I would pursue, to raise awareness of and appreciation for the contributions that chemists can make in solving our society’s problems and advancing growth through innovative approaches. See my candidate statement at: http://cenm.ag/willie-e-may and my website at: williemayacs.com for my ideas about building on this past work. If elected, I would work with the ACS Board Committee tasked with advocacy and ACS staff to advance these three goals while regularly re-examining our priorities. 5. It has been 8 years since the official end of the Great Recession. What should ACS be doing to prepare our members for the next recession? It is very wise for ACS – and chemists, more broadly – to prepare for both economic growth as well as less favorable developments. ACS has worked with many groups to ensure chemists are flexible and well trained for the future. As noted above, I would work to further enhance those programs. Thanks to Dr. May for his responses. Dr. Charpentier will have her responses published within 24 to 48 hours after it has been received. The Medicinal Chemist Jobs list has 117 positions. The Process Chemistry Jobs List has 62 positions. ...To keep projects on track, you have to know how to get decisions made. That is something that sounds simple but can be quite tricky, because what "knowing how to get decisions made" really means is "knowing what the decision maker needs to make a decision." This is not always obvious, even when the decision maker is yourself. I eventually realized that I needed some expert advice to make this decision, and now I have it. Based on that advice, I know I need to do a little more information gathering. Then, I'll need to mull it over for awhile (preferably while walking) and then by some magical internal process, I'll have a decision I feel good about. This fits my usual decision making process, which is "gather all the information and advice and let it stew a bit until my brain works out what to do." I'd tried to skip the "get expert advice" and "gather information" steps, and all the mulling in the world wasn't going to get me a decision without doing those steps. It's funny to watch veteran decision makers make their decisions, because they won't even consider making decisions without the facts that they deem necessary. 2. Your firm failed to establish an adequate quality control unit with the responsibility and authority to approve or reject all components, drug product containers, closures, in-process materials, packaging materials, labeling, and drug products (21 CFR 211.22(a)). 3. Your firm failed to clean, maintain, and, as appropriate for the nature of the drug, sanitize and/or sterilize equipment and utensils at appropriate intervals to prevent malfunctions or contamination that would alter the safety, identity, strength, quality, or purity of the drug product beyond the official or other established requirements (21 CFR 211.67(a)). Our investigator observed what appeared to be rusted and corroded screws, [redacted] fluid and debris, and metallic mesh material on the product contact surfaces of [redacted] located in your facility. During the inspection, you initially barred our investigator from accessing a room identified as a laboratory. You eventually allowed the investigator to inspect the laboratory, but he found that it contained no equipment. You then stated that the laboratory was offsite at a [redacted] residence and that you could not give our investigator access as it was not a convenient time. I think "I made a mistake" was a new one for a warning letter. A free, seven-week course on medicinal chemistry starts on Monday, October 2nd on the edX platform. The course is offered as a collaboration between Davidson College and the Novartis Institutes of BioMedical Research. Nearly 50,000 students have enrolled for the past five instances of the course. The course covers the major topics of medicinal chemistry, including drug approval, common drug targets (enzymes and receptors), pharmacokinetics (half-life, clearance, volume of distribution), metabolism, lead discovery, and lead optimization. The course also includes both weekly interviews with pharmaceutical professionals (many from Novartis) and lab exercises highlighting online tools for drug discovery. Any student who can read organic structures and identify functional groups should fine in terms of prerequisites (bio/chem/math). Students who complete the course will be well equipped to listen to and follow a drug discovery talk presented at a conference or university. The 2018 Chemistry Faculty Jobs List (curated by Andrew Spaeth and myself) has 296 positions. Want to talk anonymously? Try the open thread. The Academic Staff Jobs list has 25 positions. Adrian, MI: Wacker is searching for silicone materials research chemist; M.S./Ph.D. desired. Nashville, TN: Aegis is looking for a Ph.D. analytical chemist. Buffalo, NY: DuPont is looking for an experienced polymer/organic chemist for a research investigator position. Basel, Switzerland: Head of Catalysis for Roche sounds fun. Apple, looking for a materials chemist to join their "Panel Process and Optics (PPO) Engineering" team. Dexcom (San Diego, CA) is hiring an M.S./Ph.D. electrochemist. "Two Pore Guyz" is an interesting name for a company; looking for a nanopore scientist. Who knew that the Cherokee Nation got into the staffing business? They are looking for a DEA chemist, I think. Montclair, NJ: Montclair State is hiring an assistant professor of organic chemistry. Bozeman, MT: Montana State, looking for an assistant professor of inorganic (or bioinorganic) chemistry. Lyngby, Denmark: The Technical University of Denmark is looking for a professor working on "Surface Physical Chemistry with emphasis on basic studies—as well as industrial applications—of surface forces and molecular design of functional polymer interfaces." Beijing, China: Tsinghua, hiring "3 or 4" assistant professors. Murfreesboro, TN: Middle Tennessee State is looking for an organic chemistry laboratory coordinator. In order to better serve you, we have changed the subscriptions options for ACS Member Universal Access. We are now offering twice as many downloads at no charge. You can now download 50 articles or book chapters from any ACS Journal or eBook, as well as the C&EN Archives. Articles or chapters downloaded past the first 50 will now cost $25 per article or chapter. Your weekly subscription to C&EN magazine will of course continue with no changes, and it remains available both in print and electronically. You'll also continue to receive significant savings on open access publishing, discounts on ACS books, and special members-only pricing for Articles on Command. However, individual subscriptions to our ACS Journals will be discontinued as of January 1st. (emphasis CJ's) For more information about these changes, please visit www.acs.org/2018benefits. Why are we discontinuing the purchase of ACS Journals for Members? We continually assess the member benefits in order to make sure we are providing the most value to the broadest base of our members. An assessment of usage behaviors among members show that not only do they require broader access to ACS's entire portfolio of journals, members also required more than the annual 25 downloads we traditionally provided. Many members augmented this through additional purchases. By increasing the ACS Member Universal Access benefit to 50 articles per year, we can reduce the additional expense of purchasing journals for the majority of our members. 2x as many free downloads (old 25, new 50), but then price per goes from $12 to $25. New system costs more starting at 74 downloads. I don't know how this affects people overall. I suspect there were not that many people purchasing individual subscriptions to begin with, but I suspect that smaller companies were purchasing individual subscriptions to key journals to save some money. How many substrates are enough for robustness? ...Last month, researchers at the University of Münster proposed a screening tool that could help chemists figure out in a matter of days how well their reactions might work with functional groups on various substrates. Led by Frank Glorius, the team assembled a set of 15 commercially available additives that, when introduced to a new reaction, could tell chemists how well a sampling of functional groups responds to a particular reaction (J. Org. Chem. 2017, DOI: 10.1021/acs.joc.7b01139). ...Responding to C&EN’s poll, Eindhoven University of Technology’s Timothy Noël says it’s a good thing that standards are on the rise. However, he says, smaller research groups may suffer because they lack the resources needed to achieve the “monster” substrate tables now seen in elite journals. Noël’s group recently published a light-catalyzed decarboxylation method with 58 substrates (ACS Catal. 2017, DOI: 10.1021/acscatal.7b03019). The work was done by one graduate student and partly by a master’s student, which required a huge effort on their part, he says. Gotta say, a list of "this reaction doesn't work with that" from the authors would also be helpful. Some random d00d yapping about Skype interviews. Looks like Peter Dorhout's presidential year will focus on safety and diversity. Speaking of safety, I enjoyed this short editorial by current ACS president Allison Campbell. "One of my favourite fume hood views ever, from my former research position at Imperial. 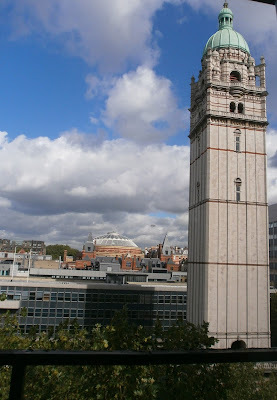 Sunlight on Queens Tower makes it look stunning." Were you laid off during the Great Recession in 2007 and 2008? Or, was your career impacted in some other significant way (lost grant funding, lost employees, shuttered your business, etc.)? If so, C&EN would like to find out how you’ve been doing since then for a feature story on the 10th anniversary of the economic recession. We’re looking for chemists from industry, academia, government, and self-employment. Please e-mail Linda Wang at l_wang@acs.org if you’re willing to share your story. This is an important topic - I am glad to see C&EN covering it. Who is being hired in Big Pharma med chem and process positions these days? What is Big Pharma looking for these days in process/med chem positions, in terms of pedigree/publications? I presume that there are some who are getting in without postdocs, and some who are being hired with postdocs - what is happening more where you are? The Medicinal Chemist Jobs list has 125 positions. Is industry better at dealing with sexual harassment than academia? While we're doing full disclosure here, I should note my opinions on the issue: I don't have any doubt that sexual harassment has and does happen in academia. For any particular case of academic sexual harassment that is brought to light in the public, I am much more inclined to believe the accuser who comes forward. I thought it was a well-researched, comprehensive and gripping article that forced the reader to confront the reality of sexual harassment in the chemical sciences. Each story demonstrated the impact of sexual harassment: a woman student who is harassed by an male adviser will find themselves isolated, confused, doubting themselves, unable to communicate these issues easily with confidants, potentially ashamed to go their family and they will face a departmental structure that is incentivized to have that student disappear. What I am most struck by in the article is the pervasive sense that academic departments and universities will continue to self-police. In my humble opinion, no academic process outside of a court of law can deliver a just outcome. After watching the UC system defend Professor Patrick Harran against the Los Angeles District Attorney to the tune of millions of dollars, does anyone think that universities will step up for those at the bottom of the academic hierarchy? I am not really one that is inclined to legislative solutions to problems, but I am certainly tempted by the article's mention of Rep. Speier's bill that would require substantiated cases of harassers to be reported to the funding agencies. If it's a bad idea, it's a useful one that will introduce some threat of accountability into the system. "Some people think industry is where the harassment happens,” Elizabeth says. “But in industry, creeps get fired." On Twitter, there were a number of people who found this statement worthy of some skepticism. I am certainly skeptical as well, but I think that it depends on what she meant by "industry." For the 40% of Americans who work at companies with more than 1000 employees, I have no doubt that HR departments (and the lawyers that birthed them) fundamentally expect and enforce a zero-tolerance perspective on issues of sexual harassment. For smaller companies? I also have no doubt that there are well-run shops where sexual harassment is not welcome, and there are some (many?) that probably have terrible cultures. The Process Chemistry Jobs List has 54 positions. Do you know an outstanding chemical technician who deserves special recognition? If so, please consider nominating that person for the 2018 National Chemical Technician Award. Nominees must be currently employed as a chemical technician, and must have worked as a chemical technician for at least five years. Technicians hold a range of titles, including process operator, laboratory analyst, technologist, and research associate. Nominees, who do not need to be ACS members, will be judged on their contributions in the following areas: technical achievement, leadership and mentoring, publications, presentations, patents, quality and safety practices, and professional and community activities. Nomination packets must be received by the ACS Committee on Technician Affairs by Oct. 18, 2017. The 2018 recipient will receive a $1000 honorarium, plaque, and a trip to the ACS national meeting in New Orleans, where he or she will be honored at a special luncheon on Sunday, March 18, 2018. For more information or to nominate someone, visit www.acs.org/ncta. Send questions to cta@acs.org. The 2018 Chemistry Faculty Jobs List (curated by Andrew Spaeth and myself) has 268 positions. The Chemistry Department of Whitman College invites applications for a tenure-track Assistant Professor position in Physical Chemistry, effective August 2018. The successful candidate will exhibit potential for excellence in teaching and will establish an undergraduate research program in physical chemistry. The successful candidate will offer courses in physical chemistry and general chemistry and will also contribute to the College’s general education requirement, with an annual teaching load of five courses. Additional duties include advising and mentoring students and participating in faculty governance at the department and college level. Whitman College is a highly selective liberal arts school that values both teaching and scholarship, offers a generous sabbatical program, and provides support for professional development, start-up funds, and benefits. Candidates must have a Ph.D. in Physical Chemistry. Postdoctoral experience and/or additional teaching experience is highly recommended. The Academic Staff Jobs list has 18 positions. Want to help out? Here's a Google Form to enter positions.that works, too. Want to chat about staff scientist positions? This post will serve as the open thread. It started innocently enough. He was a prominent chemistry professor at a major research university, and she was eager to make a good impression. “I was a pretty insecure grad student in my early years, and the fact that he was paying attention to me and interested in my work and how I was doing in his class was kind of flattering,” says Tara (not her real name). After that incident, Tara went out of her way to avoid the professor. “It was really hard,” she says, in part because his office was along the hallway she traversed between her lab and desk. Yet she didn’t report the situation to anyone. “I felt guilty, like I had somehow done something to have brought this on,” she says. Tara’s story is a common one in university chemistry departments nationwide, echoing the problems of sexual harassment in the larger science community and the nation. While chemistry hasn’t had a sexual harassment case come to national prominence yet, most female chemists can tell stories of harassment or discrimination of themselves or their colleagues. It may be among the reasons women aren’t reaching parity in chemistry Ph.D. programs and faculty positions. A new blog! Welcome to "The Compounds Turn." Nice first post on beets! Melanie Nelson is offering her "How to Get a Job In Industry" webinar on September 20. Great use of $30, I feel. Latest chemistry retractions are in Organic and Biomolecular Chemistry, I see. Also, the Chinese Journal of Chemistry. Milkshake's story is complete, I note. The Colorblind Chemist has an announcement. Great little post from Philip Ball on chemistry, color and China. ...But when demand for workers spikes, wages climb, too. Except for a handful of job titles, there isn't much wage inflation in Chicago manufacturing. The median manufacturing worker in the Chicago metro area saw wages rise 5 percent from 2012 to 2016 to $33,000 a year, even as wages for all occupations rose 6.9 percent in that period. The average 151,000 U.S. manufacturing workers quitting their jobs each month in 2016, presumably to take higher-paying jobs, was still 27 percent lower than the number quitting before the recession. Taken together, the data suggest that employers aren't so desperate for talent that they're willing to raise wages. ...Employers may not be able to afford to raise wages if they aren't making a high-margin product, or if they need to invest in new machinery, says Jim Nelson, vice president for external affairs at the Illinois Manufacturers' Association. Anyway, higher pay won't improve the quality of applicants. Job-seekers need 10th-grade math and reading skills—"Too many people apply for manufacturing jobs who are unable to read a blueprint"—and they need to pass a drug test and show up on time. "Manufacturing is not the consolation prize for an occupation," he says. "It is a high-skilled, rewarding career." Except it's a career that in Chicago has a median annual wage of $32,860. That's higher than other occupations that draw from a similar worker pool, like janitorial services or low-skilled health care like home health aides. But unlike in manufacturing, wages in those fields have grown 10 to 15 percent in recent years to roughly $27,000. It's a good article - read the whole thing. Topeka, KS: The Kansas Health & Environmental Laboratories are searching for an ion chromatograph chemist. $19.16 hourly; can vary depending upon experience and qualifications. B.S. desired. Washington D.C.: Applications are being accepted for AAAS Science & Technology Policy Fellowships. $75-100k offered. Beerse (Ville), Turnhout (BE): Janssen is looking for experienced medicinal chemists for neuroscience work. Ph.D. in organic chemistry, 2-5 years experience. Huh: Not every day you get an Indian position around these parts. Applied Materials (Mumbai, India) is looking for a M.S./Ph.D. senior chemist for semiconductor work. Urbana, IL: UIUC, conducting an open-rank search focusing on "a special emphasis on analytical, inorganic, and materials chemistry." Queens, NY: St. John's University is looking for an assistant professor of medicinal chemistry. Austin, TX: Open-field search at UT-Austin for two assistant professors. Amherst, MA: Amherst College, looking for an assistant professor of inorganic chemistry. Terre Haute, IN: Rose-Hulman Institute of Technology is hiring an assistant professor of organic chemistry and an assistant professor of analytical chemistry. Burnaby, BC: Simon Fraser University is searching for an assistant professor of nuclear medicinal chemistry. Nice name: There's a multi-university Actinide Center of Excellence? They're looking for postdocs at various universities (Notre Dame, Washington State, Oregon State, Minnesota, Northwestern.) Must be U.S. citizens or permanent residents. The Medicinal Chemist Jobs list has 160 positions. The Process Chemistry Jobs List has 50 positions. Crazy thing happened. A Prof. emailed me for a personal reference after interviewing someone for a job that seemed like a great fit. Only problem? I had never heard of this person. They said they worked in my lab from 2013-2014, year I started. Unlikely I'd forget someone. Just in case, I asked everyone that had been in the lab that year if they remembered this person. They did not. They checked notebooks too. One of my students TA'd this person but I never taught this person. Looking back at my emails, this person had asked if they could do research in my lab but I said I had no space. Anyway I told the Prof. this person never worked n my lab. Prof emails me the next week. Says this person listed the wrong name on CV. They worked for a Jenny Yeng that was only at UCI for 1 year, ran a small group, and somehow does the same research as me. I said there is no such person. Prof. said they talked to this 'Jenny Yeng' on the phone. Said glowing things about the candidate. So this person lies on their CV. Gets caught. Makes up a fictional person to serve as a reference. And it cost them a job. I sure hope they learn a lesson and decide to revise their CV and be honest. I don't have much to say about this, other than the obvious: eventually, lies get caught. 1. Your firm failed to establish and follow adequate control procedures to monitor the output and to validate the performance of those manufacturing processes that may be responsible for causing variability in the characteristics of in-process material and the drug product (21 CFR 211.110(a)). Your firm released multiple lots of homeopathic in-process powder blends prior to attempting to validate your manufacturing process. You manufacture [redacted] homeopathic in-process powder blend mixtures which you send to Raritan Pharmaceuticals Inc. (Raritan), a contract manufacturing organization, to produce finished homeopathic drug products for the United States (U.S.) market. Some of your powder blend mixtures are manufactured from ingredients that pose potentially toxic effects. For example, your Infants’ Teething Tablet [redacted] contains belladonna. Raritan uses this powder blend mixture to produce finished drug products for infants and children, a population vulnerable to the toxic effects of belladonna. You shipped [redacted] lot [redacted] of Infants’ Teething Tablet [redacted] to the U.S. market before evaluating whether your manufacturing process was reliable and reproducible. Your operators use a [redacted], an inherently variable process, to [redacted] produce in-process powder blends, including those made from toxic ingredients. You did not test the in-process powder blends for adequacy of mixing to assure uniformity and homogeneity prior to release and shipment to your contract manufacturer, Raritan. FDA collected samples of your in-process drugs ([redacted] lot [redacted]) during our September-October 2016 inspection of Raritan. FDA analyses indicated that your in-process drugs were not homogeneous in composition. Raritan used your powder blends to contract manufacture adulterated finished drug products that you marketed for use in infants and children in the United States. FDA analysis of finished drug products made from your in-process blends also demonstrated non-homogeneous composition. We acknowledge that the teething tablets made from your non-uniform powder blends were recalled. As it turns out, they weren't very homeopathic, and the health news website STAT had a long article in February detailing the many hundreds of children who were injured (and the 10 children who died) by the belladonna (a poison!) that was used as the active ingredient in these tablets. As a parent and a scientist (and someone who works around the pharmaceutical manufacturing space), I am saddened and angered that non-homogeneous blending was the final hole in the Swiss cheese that allowed these poisonous tablets to be released to the public. Alex Tullo and Melody Bomgardner cover the recovery of the chemical enterprise in Houston. John Lechleiter, leading the way for chemist/CEOs! Incidentally, there is interesting method to his donation madness, I suspect. The 2018 Chemistry Faculty Jobs List (curated by Andrew Spaeth and myself) has 238 positions. As Research Scientist located at Zucrow Labs, you will carry out research and administrative duties beyond the scope of individual students and post-docs in the synthesis, formulation, and characterization of energetic materials. You will utilize your expertise to improve the technical expertise of the College of Engineering Pre-Eminent Team in Energetic Materials, and develop new research avenues utilizing existing and improved experimental resources. CHANNELVIEW, Texas — Public health officials are investigating a case of dangerous liquid mercury that appears to have washed or blown ashore here, east of Houston, in the aftermath of Hurricane Harvey. Bobby Griffin found the clusters of shiny silver mercury globules scattered across his San Jacinto riverfront property on Tuesday, a few hundred yards from the San Jacinto Waste Pits, a Superfund site that was inundated during last week’s storm. ...The National Institute of Environmental Health Sciences says that mercury is extremely dangerous, “with a few drops generating enough fumes to contaminate the air in a room.” It is less dangerous outside, but it poses a hazard if people pick it up or stand near it. Mr. Griffin, who earned a living renting out mobile homes on his land until the storm wrecked them all, first noticed a spray of silvery dots in the wet sand that clung to his bare toes on Tuesday. He called out for a New York Times reporter who happened to be on his property, looking for toxic contamination left behind after the storm, to come over. Mr. Griffin, 57, picked up one cluster with his knife, tipped it into the palm of his left hand and watched it dance, split into pieces and come back together. That doesn't sound like a good situation... time to get out the elemental sulfur? The Medicinal Chemist Jobs list has 155 positions. The Process Chemistry Jobs List has 41 positions. What do you think should be here? The list will be short enough that I think polymer-oriented and formulation-oriented positions should be on this list. Should chemistry majors learn to code? ...Software better geared to those earning chemistry degrees or conducting research is readily available. Common examples include MATLAB, Python’s SciPy stack, and GNU Octave. The last two are free, open-source packages. So why haven’t these become standard tools taught to all undergraduate chemistry majors? A key barrier to their adoption is that each of these packages requires some level of programming ability ... and computer programming is not part of the standard training for chemists ... but it should be. Learning computer programming is an invaluable skill for chemists, as it empowers them to do more with collected data and, ultimately, to be more efficient and effective scientists. A competitive edge today doesn’t necessarily go to the person who can collect the best data but to the person who can best process and analyze the data collected. This nuance involves automating repetitive and time-consuming tasks, mining large data sets that don’t fit well in spreadsheets, and extracting information and trends too subtle or complex for people to discern without computers. As always, I view claims about employability at arm's length. Until Professor Weiss can show me data indicating that chemists with coding experience are hired more often or with higher salaries than those without, I will view his assertion with some skepticism. Still, it seems very likely to be true. Still, I don't think anyone would strongly argue against Professor Weiss' suggestion that chemists learn how to code. I think the far more substantive debate would be: what in the 4-year chemistry curriculum should be dropped in favor of coding courses? * Readers, what say you? *My suggestion: add a coding module to each of laboratories in traditional 4-year programs (i.e. general, organic, physical, analytical.) Note: I Am Not A Chemistry Professor. 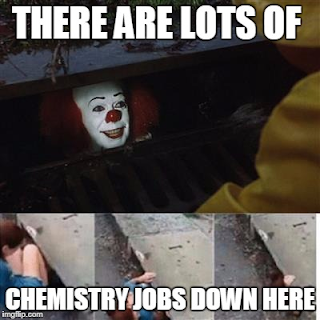 The 2018 Chemistry Faculty Jobs List (curated by Andrew Spaeth and myself) has 196 positions. Federally-funded postdoctoral position in the Wuest Lab at Emory University (Atlanta, GA) starting January 1st, 2018. Ideal candidates will have broad interests in multidisciplinary research focusing on antibiotic design and target identification. Research experience in either traditional organic synthesis or microbiology (bacteria/antibiotic resistance) is preferred however everything in between will be considered if there is research overlap. A strong publication record, evidence of independence, solid communication and writing skills, and ability to work in a collaborative atmosphere are essential. Our group is composed of a diverse student population with a range of skill sets which has been key to our success, accordingly we encourage applications from all backgrounds! Please submit a CV, Research Summary, and ONE PAGE overview of how your skills will advance the our research. Owensboro, KY: Swedish Match North America is looking for an analytical chemist; B.S. in chemistry desired. Golden, CO: TDA Research is searching for a research scientist. Ph.D. with 0-5 years experience, "Experience in one or more of these areas: coatings, corrosion, corrosion inhibitors, sensors, organic functionalized materials and/or material science"." Rolla, MO: Brewer Sciences, searching for an intellectual property specialist. West Point, PA: Merck is hiring a scientist in biomolecule process development; B.S./M.S. in chemical engineering desired. Also, they are looking for a scientist in high throughput process development. Ithaca, NY: Cornell University is searching for an assistant professor: "Outstanding candidates with research interests in analytical, biological, inorganic, organic, physical, and theoretical chemistry who complement rather than duplicate our existing strengths are encouraged to apply." Stanford, CA: Stanford University is hiring an assistant professor; lotsa buzzwords in that ad. Eau Claire, WI: The University of Wisconsin - Eau Claire is looking for an assistant professor of analytical chemistry. Lawrence, KS: The University of Kansas is looking for two professors of medicinal chemistry. Bakersfield, CA: California State University - Bakersfield is searching for an assistant professor of physical chemistry. An unexpected amount of opinion about foam mattresses from letter-writers. The latest metathesis papers from All Things Metathesis. The Sustainable Nano blog on scientific jargon. Lots of interesting (German language) links over at Stellen für Chemiker. Great little remembrance from Prof. Markus Ribbe.